Destiny Is a FPSMMO with tons to explore and do. From the creators of Bungie who made a little game franchise called HALO and with the backing of Activision Destiny was set to be a game to get excited about, but did we? Well ...YES! Destiny has beautiful 1080p graphics and 30fps with a massive scale of different planets to explore, EARTH, MOON and VENUS just to name a phew. The game allows you to pick from one of three charactors to start with. you can either be a Warlock with the special abaility of being able to conjure up magic and blast your oppenents into the atmosphere or you could choose to be a Titan, Who is needless to say built like a tank so his armor can withstand some brutal attacks and then you've got the Hunter who's fast with some devastating attacks equiped with 2 blades. 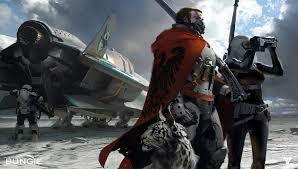 All characters are accompanied by a small robot called Ghost, Ghost is by no means a throw away character he is either spawning your sparrow so you can jet around the planet or adding witty comments whenever things are about to get a bit hairy. The game is fluid and has always got something for you to do, whether it be the main story which you can play cooperatively with friends or go on patrol and explore the exciting beautiful enviroments, Or Play competative multiplayer against other players from around the world . Destinys ranking system is built in such a way that it makes you explore and play the story to unlock rare items and search chests hidden around the worlds. But you can also visit the Tower which is a place to pick up bountys for more xp these bountys act as challenges so if your good at blowing heads off you may want to pick a challenge relating to your skillset. You can also buy armour, weapons, upgrades and more. Personally i think you find the better stuff exploring the worlds and really earning the piece of armor which you just spent 1 hour trying to get breaking through a Hives hideout only to be confronted buy a plasma throwing giant. The upgrades for your character seem a bit pointless in the way that once you have leveled up it lets you upgrade but when you get into the upgrade tree you see only one thing unlocks at a time so you cant pick and choose what skill to upgrade first. Saying that this amazing piece of work really does feel finaly like a next-gen game. When you explore the planet on patrol mode you can just spawn your sparrow and jet around the planet whilst seeing other players doing there own thing, You can either decide to jump in and help the defenceless or go search for rare items in caves. If you have'nt decided whether or not its worth your well deserved money then i would just say this too you. If you like open world games where you can explore and do missions with your friends and if you like a good snappy story with leveling up capabilities with the added bonus of competitive multiplayer then i say too your sir or madam "GET TO YOUR NEAREST OUTLET AND SPEND YOUR MONEY". We rate Destiny 8/10. BELOW IS A BIT OF GAMEPLAY RECORDED WITH THE XBOX ONE'S GAME DVD'R ENJOY ;-).